Summary: Brothers and rivals, Gavin and Will deGranville have much to prove to themselves and each other when they join their father, Sir Thomas, in King Richard’s crusade to the Holy Land. Riding the exquisite red horse Hosanna, Will proves his mettle as a Christian soldier. At the same time, fighting on the opposite side, Saracen warrior Kamil proves his own worth. When Hosanna falls into Kamil’s hands, soldiers on both sides of the conflict realize there may be common ground between them after all. But can one horse really forge peace between armies out for blood? Summary: Constable Piers deScabious barges in on Gavin and Ellie’s wedding with the claim that King Richard is dead! John claims the crown and has given Ellie to deScabious as a bride. DeScabious carries off his intended, leaving Will and Gavin to sort out their next move. Will wants to rescue Ellie, refusing to believe Richard is dead without proof, but Gavin is reluctant to pursue deScabious and risk John’s displeasure. Meanwhile, Richard is very much alive, held captive by the German Emperor. The rightful king dispatches Saracen soldier Kamil to contact the deGranvilles. En route, Kamil rescues Will’s beloved horse Hosanna, but what will become of Ellie in the midst of feuding monarchs and families? Summary: Kamil has been living in the deGranville household for some time, and this odd arrangement has finally come to the attention of the Old Man in the Mountain. 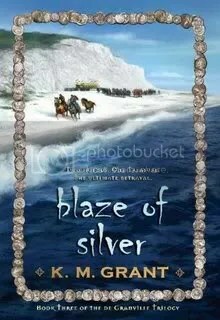 The Old Man sends his faithful servant Amal to England to entice Kamil into betraying his Christian friends. When Kamil discovers Amal’s and the Old Man’s treachery, he is horrified and ashamed and also cornered. All the while, Will and Ellie are learning to rely on each other as they attempt to reach their captive king. Once more, across faith and cultural lines, everyone seems to find hope in one red horse. But when the previously infallible Hosanna cannot keep pace with the silver mare Shihab, the fates of a family, a kingdom, and two countries, as well as the lives of the deGranvilles and Kamil, all hang in the balance. 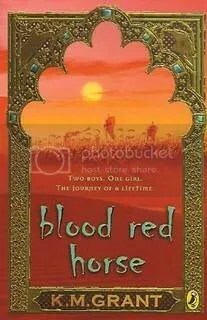 Notes: Even though Will and Kamil share a special bond with the Blood Red Horse, readers expecting to become emotionally attached to Hosanna will be disappointed. In all three books of the trilogy, the primary focus is the human characters. The horses function as necessary literary accessories in a story about knights in armor. 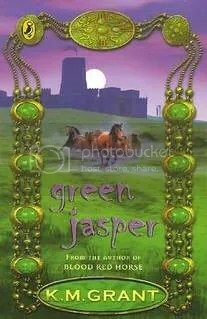 That said, the trilogy is great reading and there are splendid passages about horses and riding. Light and entertaining, it is emotional without being draining and will satisfy readers who enjoy a blend of history, romance and adventure.